Chrichton's World: Review You're Next (2011): Slightly overrated but good fun although it will make you scream at some characters! 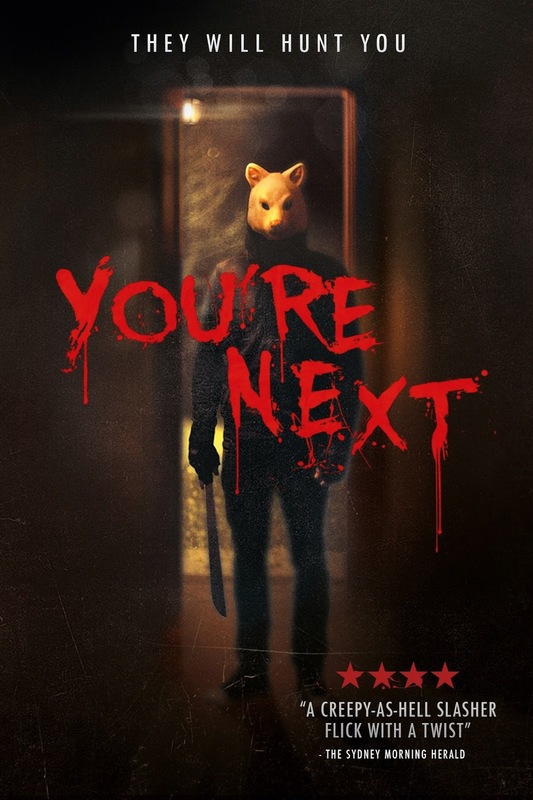 Review You're Next (2011): Slightly overrated but good fun although it will make you scream at some characters! To tell you the truth I wasn't feeling like watching this title since I am not a big fan of home invasion type of horror films. Most of the time because often it's a sub genre that takes itself far too seriously even when often it is incredibly unrealistic. Especially because of The Strangers (which was beyond dreadful) I try to stay away from these types of movies. You're Next is a little different and adds some humour into the mix. Now it's not always very clear if something is intentionally funny or if it is a case of real bad acting but it was something I could overlook. Meant as black comedy or not You're Next does starts out quite seriously and makes you fear for the lives of the characters. Until we get to see them act like complete idiots. All logic and reason these people had is totally gone. (At one point you almost are rooting for the villains.) Luckily for us there is one character called Erin (Sharni Vinson who you might know from Patrick (2013)) who keeps her wits and is the only one to not go down like a chum. There are many flaws to point out that could prevent you from enjoying this film. However I do think seeing of how much fun I had it would be a little unfair. Just know that it is far from clever and very flawed. But it does a lot of things right and certainly is very entertaining. But whatever you do, don't take this too seriously because I do doubt these film makers did. A lot of hype has been build up about this film and while I can understand it to an extent I do feel that You're Next is a little overrated. But overall it is very good fun and certainly worth your time.